Fire damage can be incredibly devastating. Our goal at SERVPRO of Billings is to make your life a bit easier after experiencing a loss. Our team takes great pride in the work we do and strive to give you the best service possible. Commercial Fire Damage in Billings, MT. Fire damage never strikes your business at a good time. 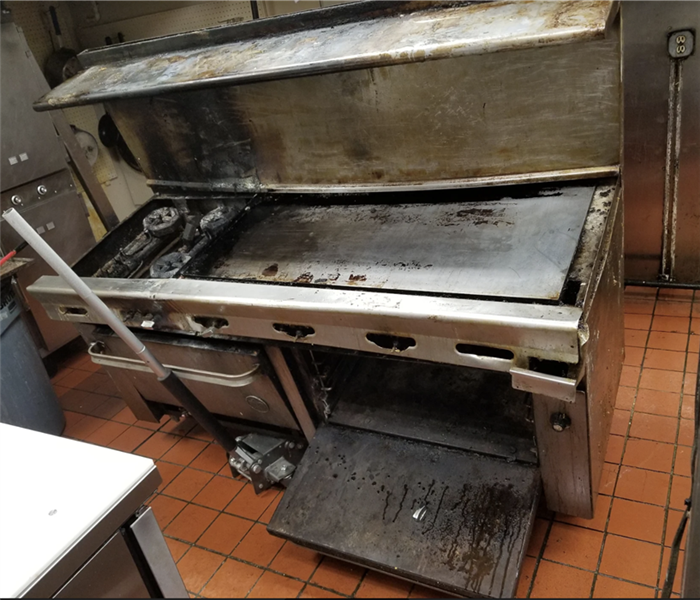 Recently, our SERVPRO of Billings team was called to action after a local Billings, MT, the business experienced a severe fire loss. Our team quickly got to work to get this business back in business! If severe weather damages your Billings, MT, home or business, call our SERVPRO of Billings team! Our team has the training, knowledge, and equipment needed to clean up and restore your home or business back to preloss conditions. If you suspect or have discovered a mold infestation in your Laurel, MT, home or business, call SERVPRO of Billings today. Mold can be very toxic and cause various negative health effects. Give us a call today! Storm Damage in Acton, MT. 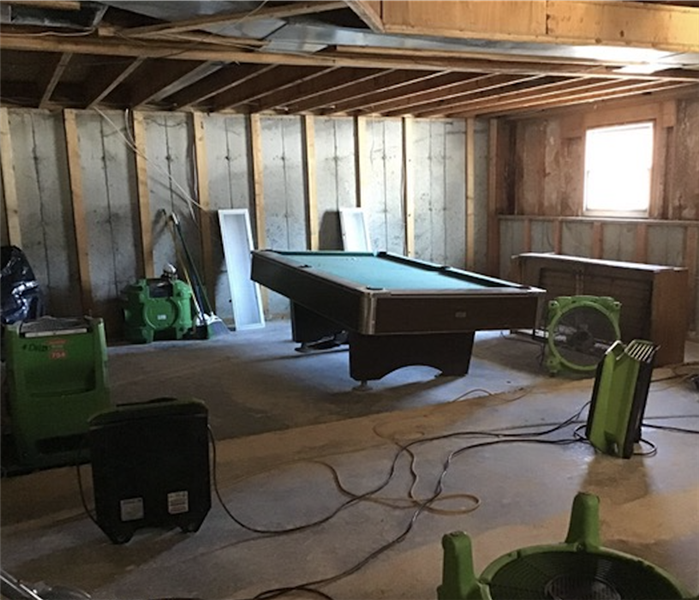 Recent heavy rains caused substantial damage to this Acton, MT, basement. 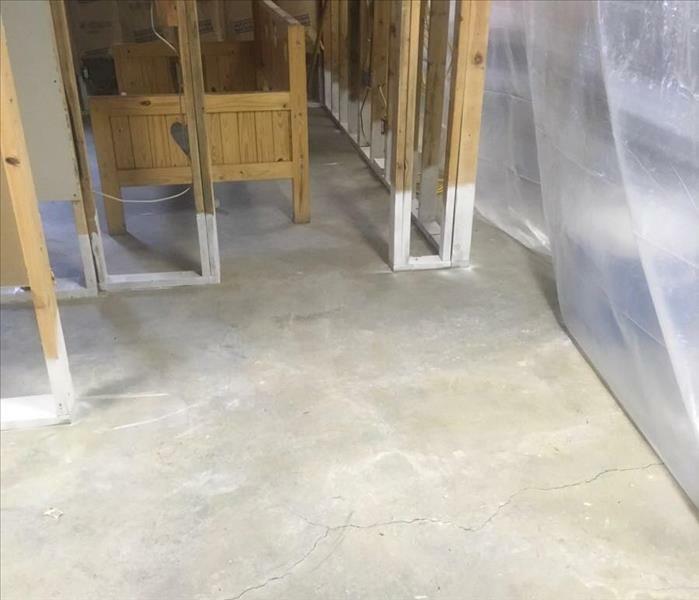 When a water loss occurs in your home or business, you need to call a certified restoration company as quickly as possible. The longer the water gets to sit, the more damage it can cause to your property. When disaster strikes your Laurel, MT, home, you will need a company you can trust. 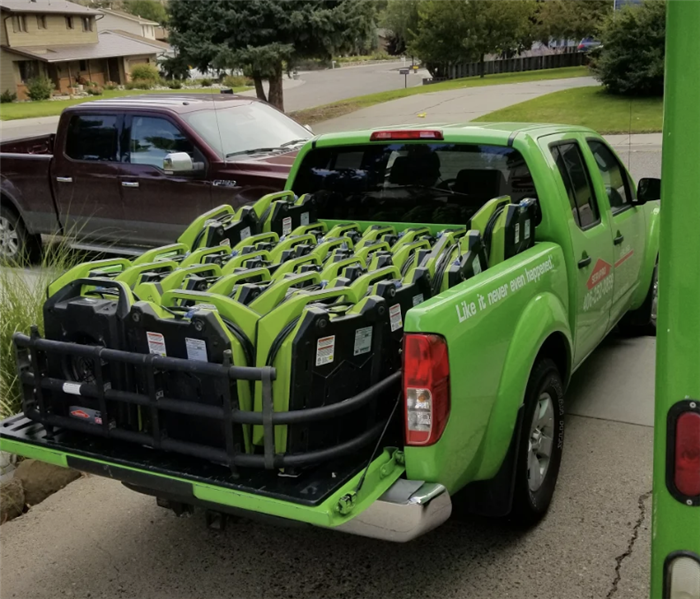 SERVPRO of Billings has the experience, expertise, and equipment needed to properly clean up and restore your home or business. Fire Damage in Billings, MT. SERVPRO of Billings was called to action after a fire severely damaged this Billings, MT, home. Fire damage cleanup and restoration is not an easy task to take on, call our SERVPRO team to take care of it for you! 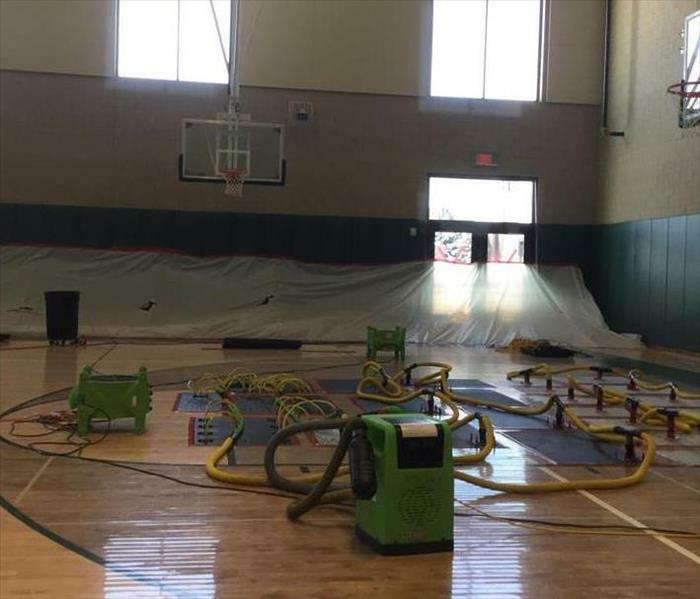 SERVPRO of Billings responded to this commercial facility for a large mold loss. Our team was detailed in setting up a strong containment around the affected area. No job is too big for our team. 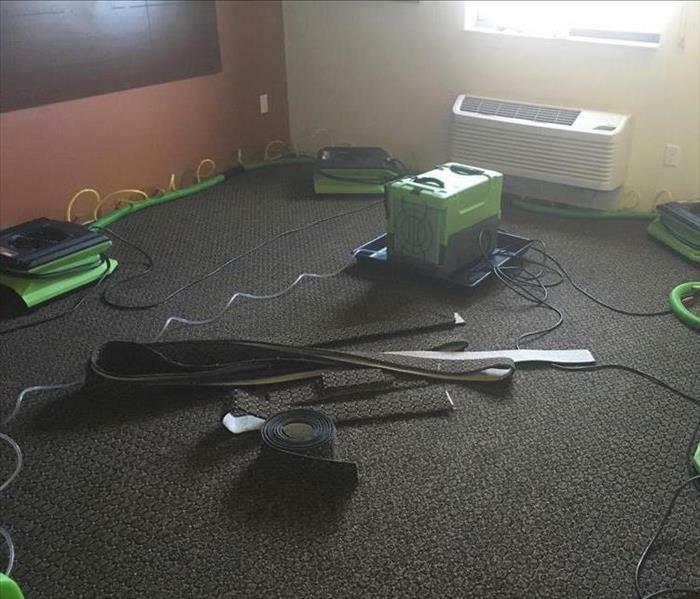 This local business called SERVPRO of Billings to get their floors dry after water had flooded their first floor. We extracted the standing water and placed the proper drying equipment to get the area dry quickly. 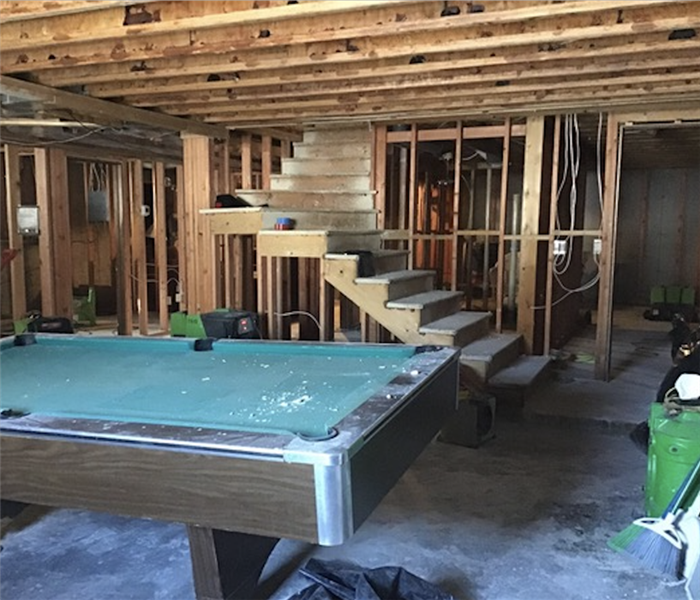 When we come in to a home or business that has damage from water, fire or a storm event, we work hard to complete the restoration to the absolute best of our abilities. We keep the work focused and as organized as possible. We arrived to this commercial building to remove standing water in some areas and dry out the facility completely. We are always ready to arrive promptly and get the job done right. 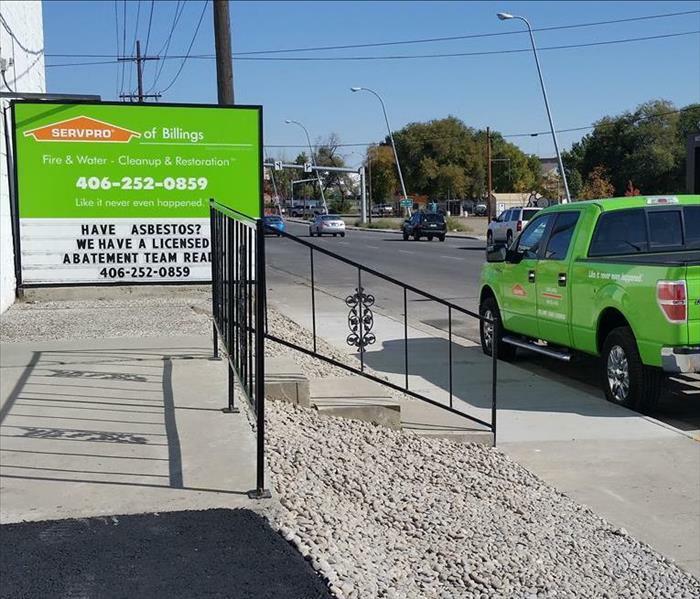 SERVPRO of Billings should be your first call! These real wood floors can be tricky to get dry. SERVPRO of Billings has the innovative technology and the specially trained experts to get this job done efficiently. We worked hard to get them dry and ready for the students again. It is important to tightly contain an area where mod is being removed and treated. Mold and mildew particles can travel through the air and can grow on anything they land on. 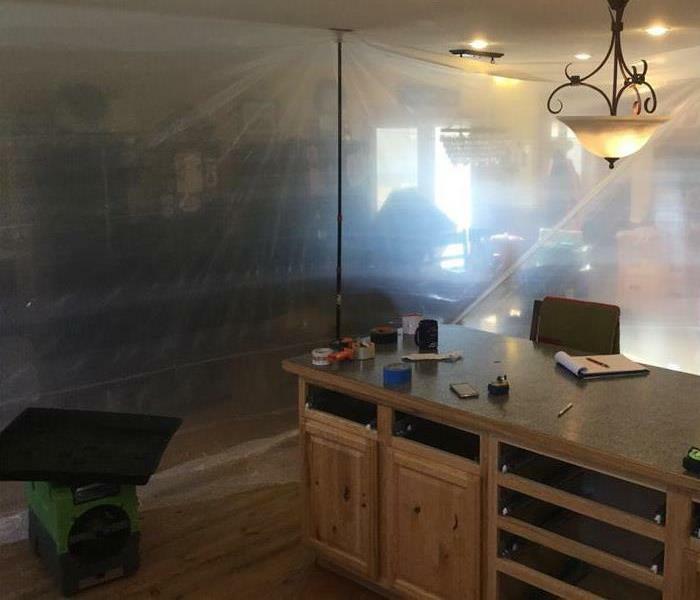 Containment helps to keep those particles in the area that is being treated and in turn greatly protects the rest of the un-affected home or business. A house fire is not ideal at any time of the year, however, it happens none the less. This homeowner called us in and was grateful for our speedy response and our process. We worked hard to get this home back in order after a fire. 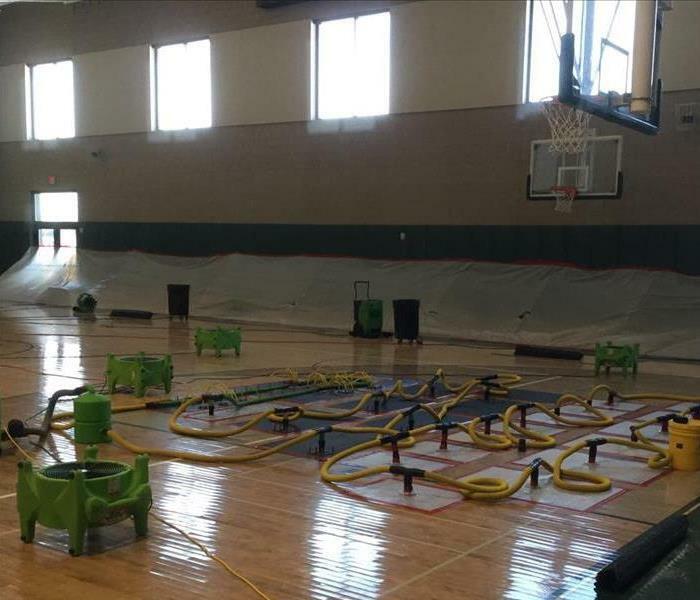 SERVPRO of Billings is always up to date with the latest and greatest techniques for water mitigation and fire restoration. We work hard to keep ourselves trained and knowledgeable on the new innovative ways to get your home back to normal. As leaders in the industry we strive to be the absolute best solution to any restoration problem. In Billings this homeowner called us to help them after a winter storm damaged their roof and ceilings their home. We realized when we arrived it had been a few days since the storm and in that short time mold had taken up residence in their ceiling beams. We immediately got to work removing the mold from their home. 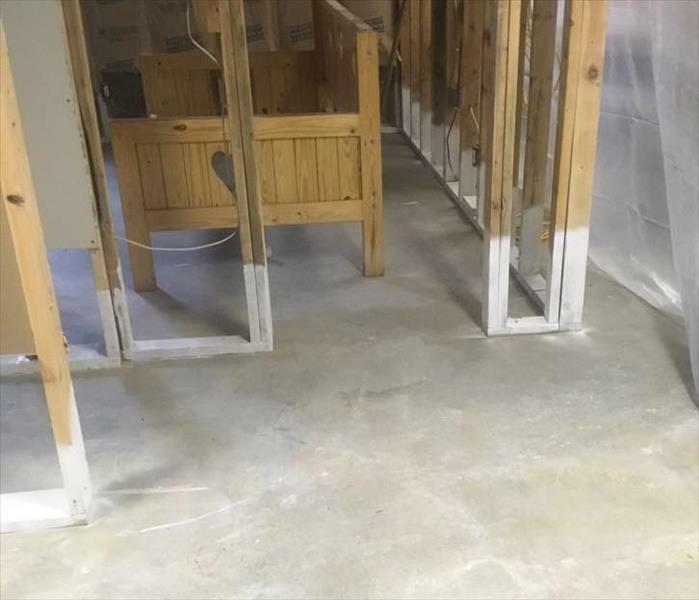 After we removed all wet and damaged flooring and sheetrock, we ensured the area was properly dry. We used out high powered fans and dehumidifiers to make sure the moisture was gone. Once we complete these steps we then treat the area with a strong anti-mold agent. An early winter storm this year left this Billings homeowner in a mess. 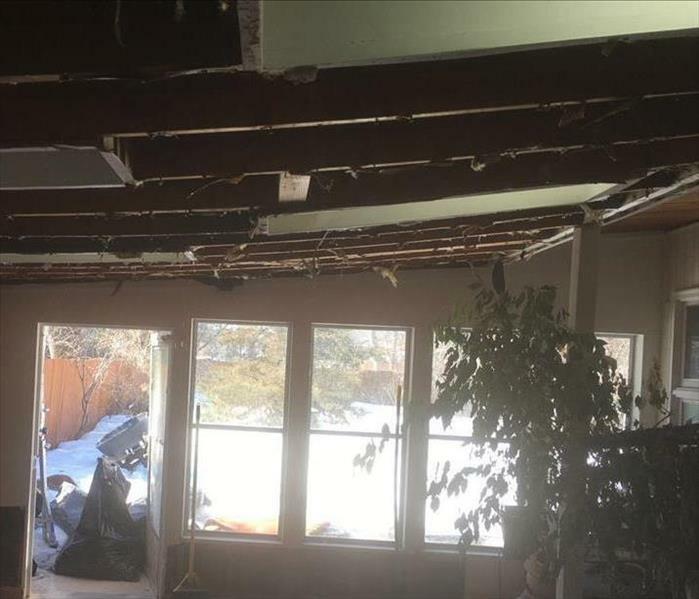 Water damage affected the entire home as the snow melted. 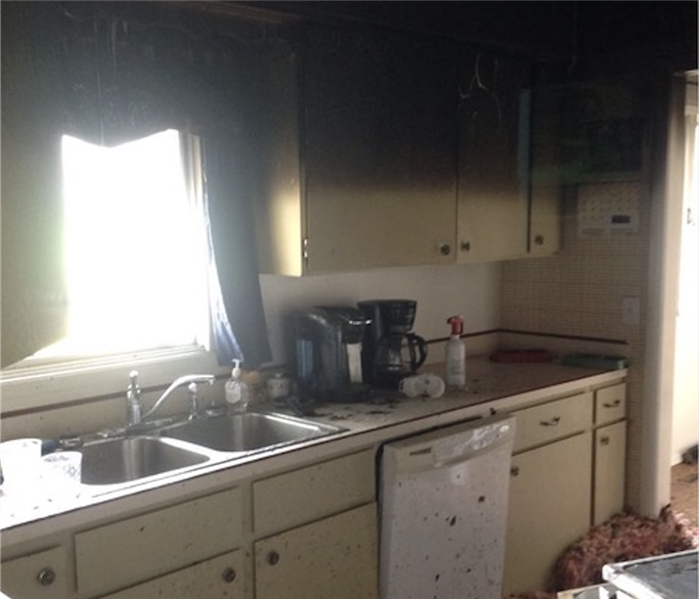 SERVPRO of Billings was able to respond quickly and get to work restoring the home. 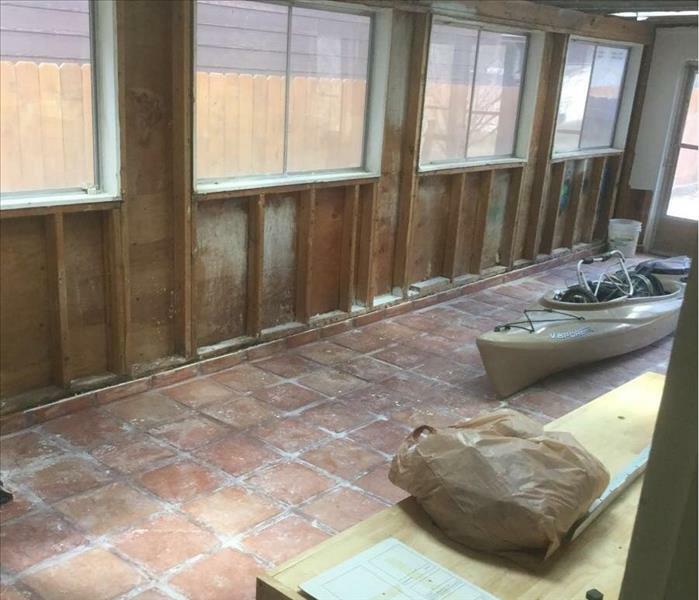 When SERVPRO of Billings responded to his Laurel home owner there was about 6 inches of water in the basement. We were able to carefully extract the water from the basement at the proper pace to prevent compromising the foundation. This Billings home owner called our experts at SERVPRO of Billings when they found mold in their home. 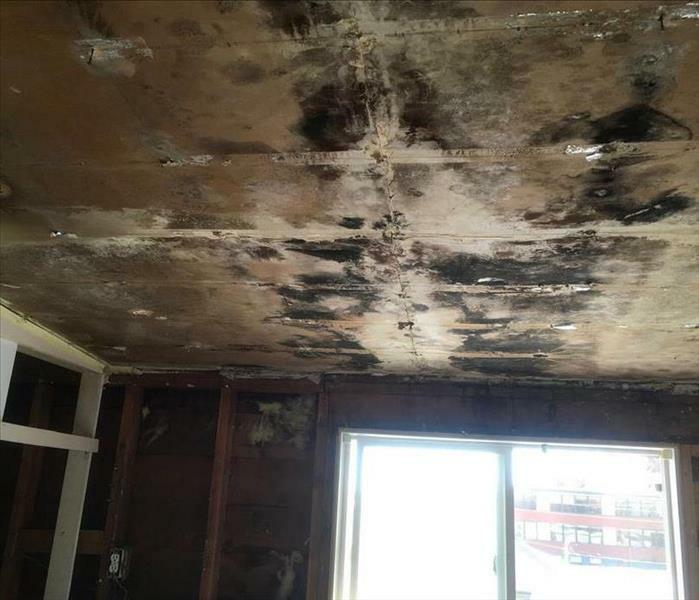 Our trained experts knew just how to remediate this mold and make it "Like it never even happened." 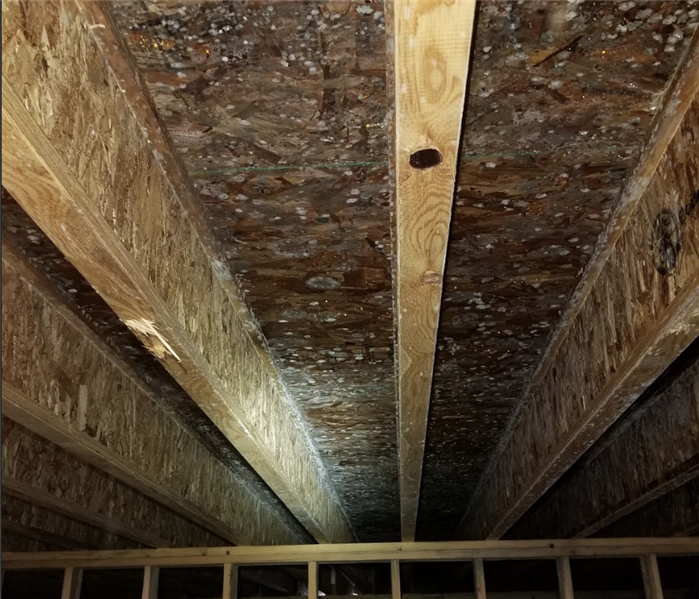 This home had a severe water loss and the moisture wasn't all able to be immediately addressed. As a result, the mold pictured here began to develop. 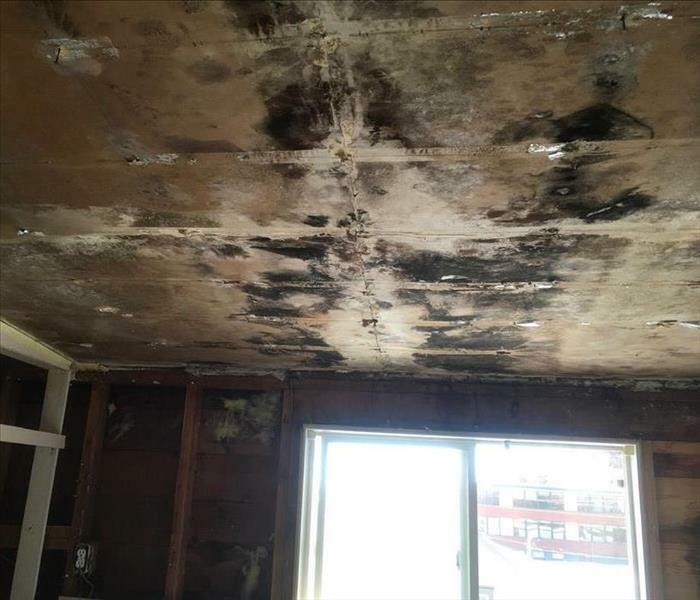 If your home suffers a mold loss, call SERVPRO. 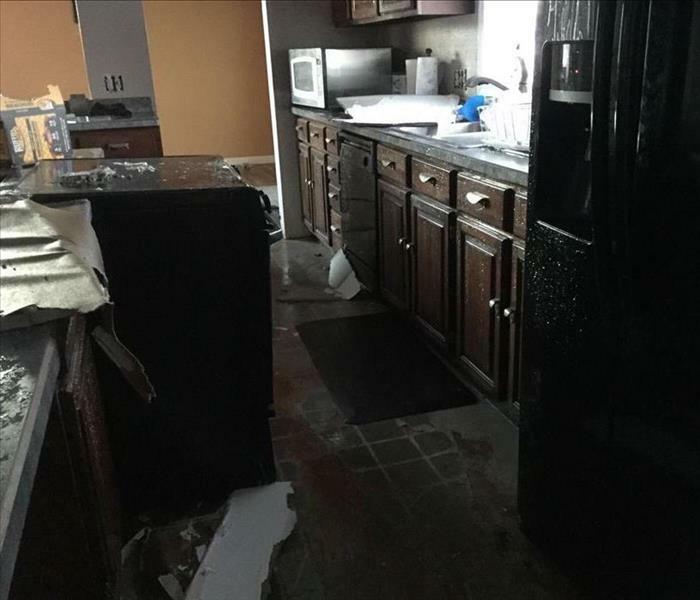 In this image, you can see a kitchen that has been severely water damaged. This image was taken before demo. Our team was able to repair the damage more quickly than the owners expected and they were thrilled. 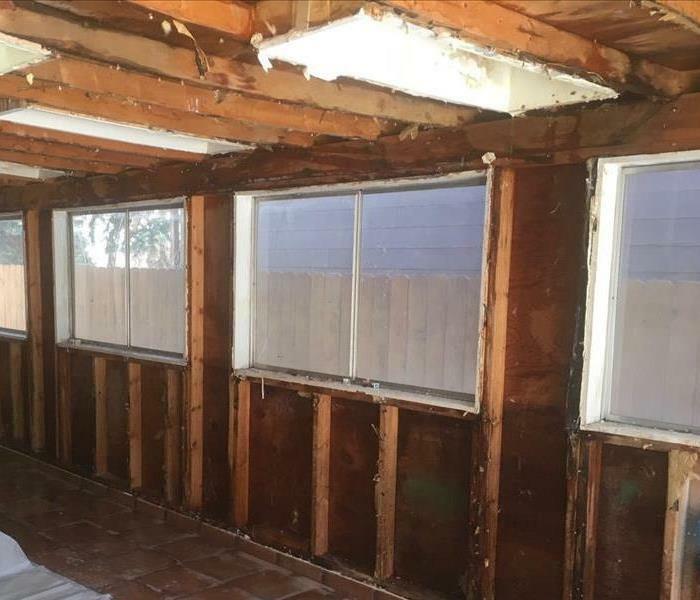 As you can see from this image, this home needed quite a bit of demo in order to repair the damage after it experienced a water loss. If your home suffers damage like this, give us a call! 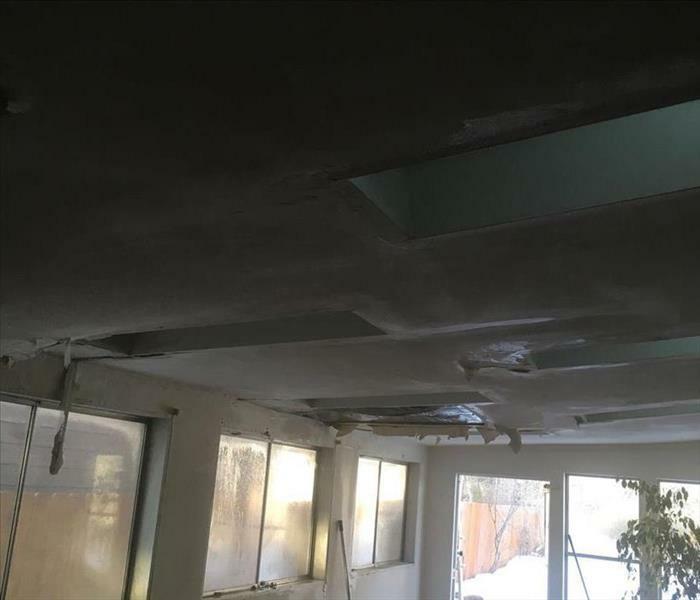 The ceiling in this image was damaged by a water loss and our team was brought in to handle the cleanup and repair of this home. If your home suffers damage due to a water loss, give us a call. 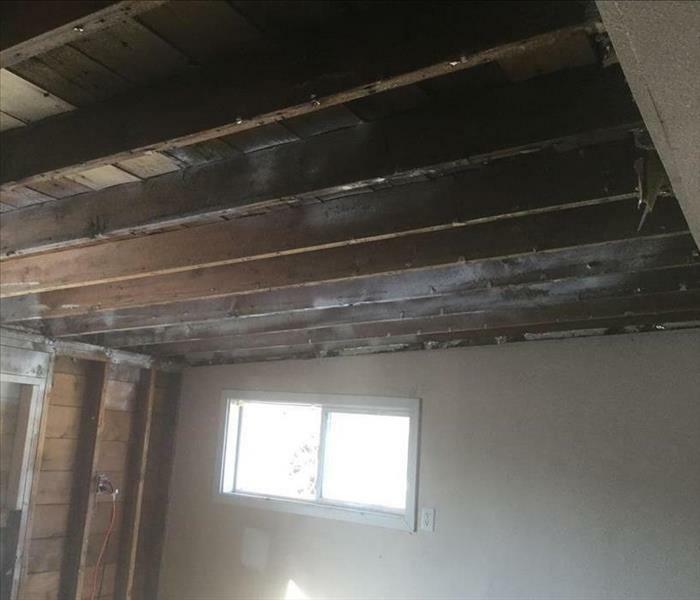 This ceiling was heavily damaged by a water loss and our team was brought in to clean up and repair the damage done to the home. This image was taken after the demo on the ceiling had been done. 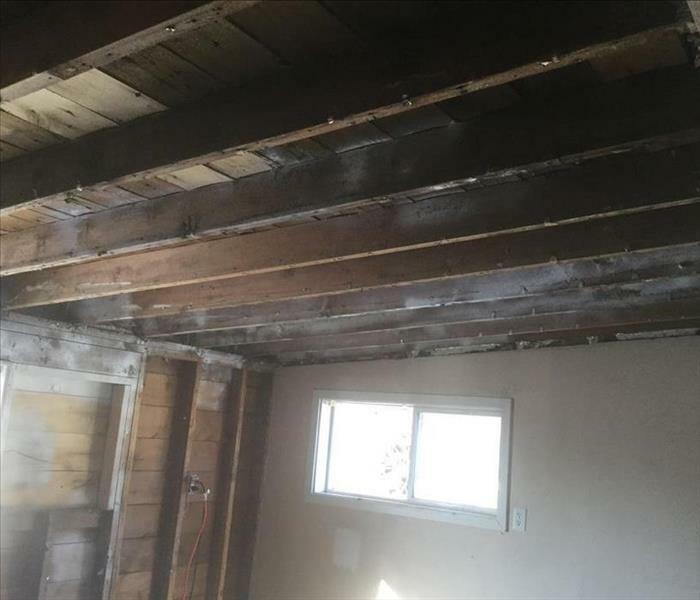 As you can see from this image, this home required extensive demo work to repair the damage after it experienced a water loss. 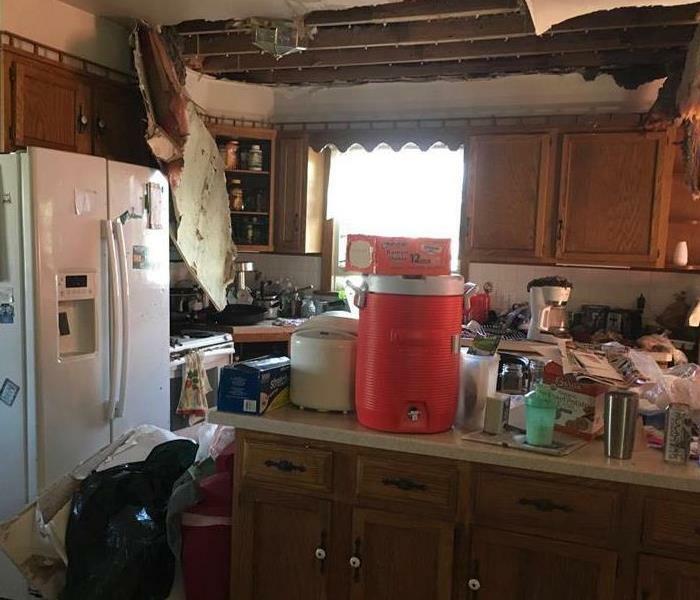 If your home has damage like this, call SERVPRO. We are faster to any size disaster. 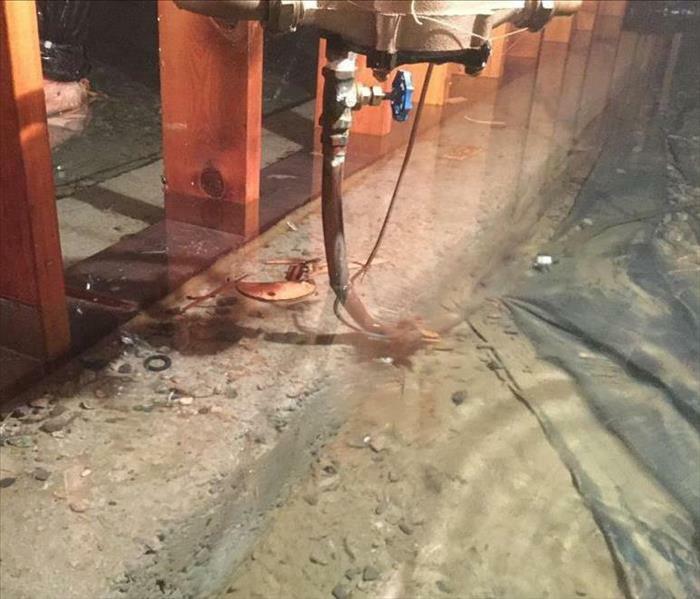 Heavy rains caused water to back up into this crawlspace, leaving it flooded as you can see in this image. Our team responded quickly and we were able to extract the water. 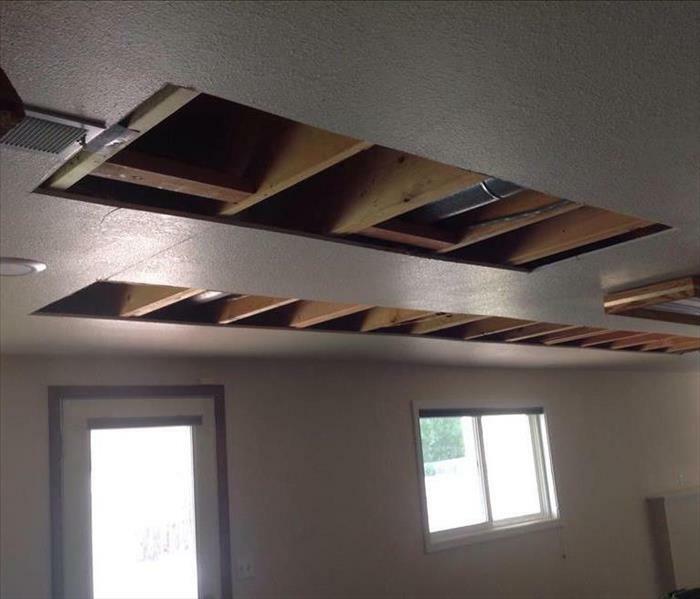 If your home suffers damage like this, call us! Water can seep through the slats in your hardwood flooring. When this happens, moisture can get trapped underneath. That is what happened in this gym. As you can see, we used drying mats to help remove the moisture that was trapped under this flooring. A ridge of ice that forms on the edge of your roof and prevents water from draining is called an ice dam. 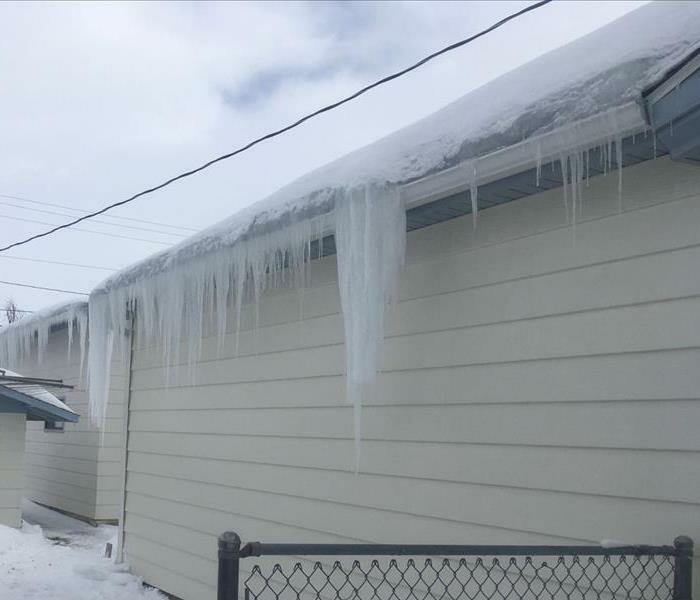 Ice dams can cause water to back up into your home which in turn can cause lots of damage. The home in this image had a serious mold problem after moisture from a water loss wasn't addressed immediately. As you can see, there was quite a bit of mold, but we were able to take care of it. This home had a massive amount of fire damage. SERVPRO of Billings, was quick to get on site and begin the cleanup process. It is important to document each step of the process when proceeding with a fire cleanup. This way if the insurance company has any questions, you will have plenty of records available. 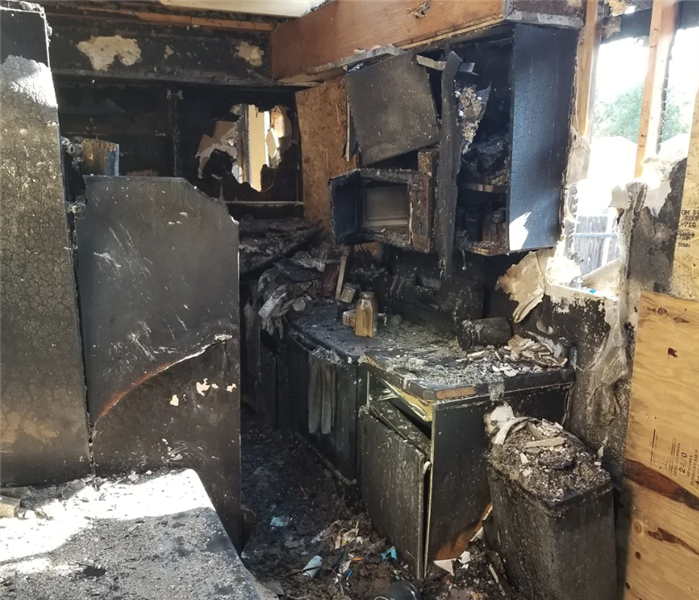 This kitchen had a massive fire loss. SERVPRO of Billings was quick to respond and start the mitigation process. We had to remove a lot of the damaged materials in order to clean and start the build back process. This home had mold growing on the walls and carpet. 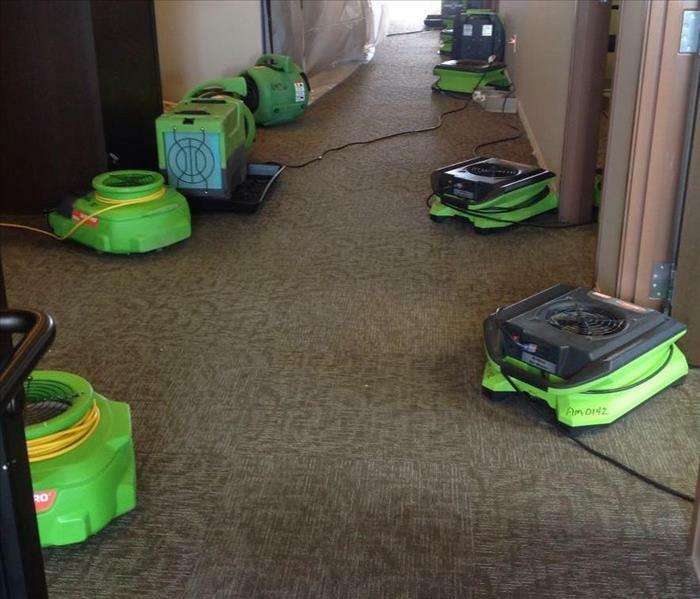 SERVPRO of Billings was quick to respond and start the cleaning process. It is critical to make sure everything is followed in according to the IICRC when dealing with mold. This home had a massive fire that caused significant damage. SERVPRO of Billings was on site immediately to help start with the mitigation process. Once we got the affected materials removed, they were able to start the cleaning process. This home had extensive fire damage. 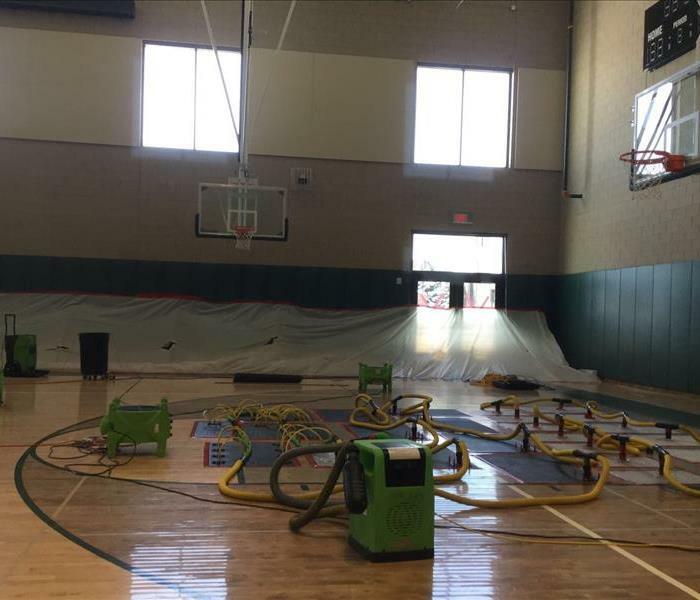 SERVPRO of Billings was quick to respond and begin the mitigation process. We spent several days removing damaged content and cleaning the structure. It is critical to work quickly and save as much as the structure as possible. Our office is centrally located to help your with any size commercial water or fire loss. We are quick to respond and begin the mitigation process with any size loss. If you have any questions do not hesitate to reach out anytime of day. 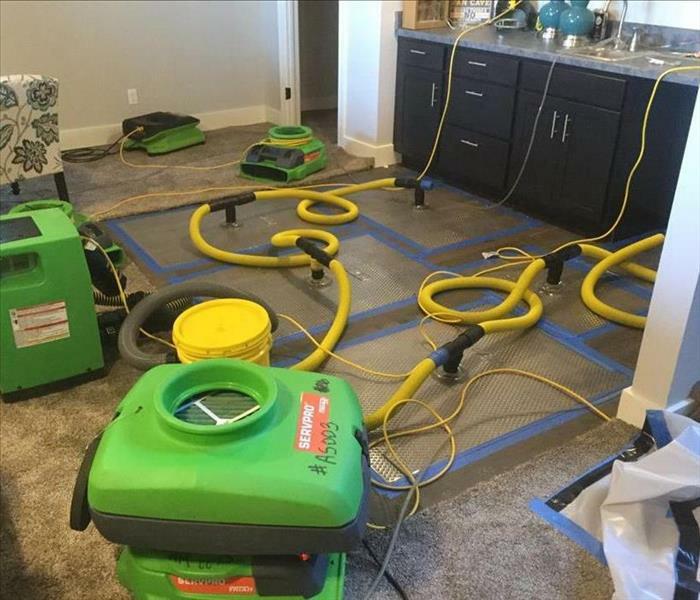 SERVPRO of Billings was quick to respond to get water extracted in this home and quickly get drying equipment in place. It is critical to act fast when you have a water loss in your home.